I have a t-shirt with the Owl Cave map on. It's so awesome. I love in the last episode of Season 2 when Coop, Truman and Hawk are all in Truman's office and that eerie dark woods theme playing. Coop says, 'Giant, little man.' Then Pete Martell walks in and says, 'Grand Theft Auto. The Log Lady stole my truck.' Coop says something like, 'The Log Lady didn't steal your truck. Wyndham Earle stole your truck. The Log Lady will be here in one minute.' It's exactly one minute in real time. That scene is timeless, ironically. 🙂 I loved how that theme played when Hawk was heading toward Glastonbury Grove. Maybe an eclipse??? Or the actual moon phase. 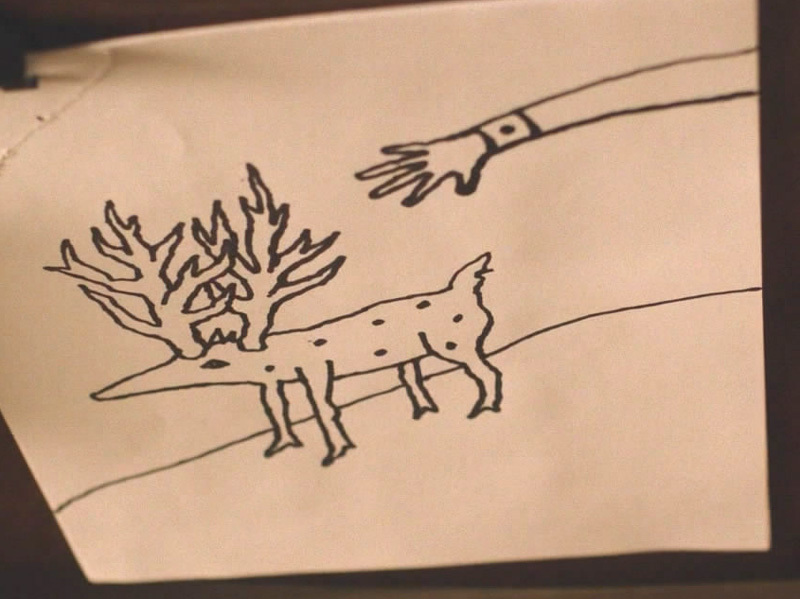 This reminds me of Cole's drawing of the deer / moose thing in the previous episode. 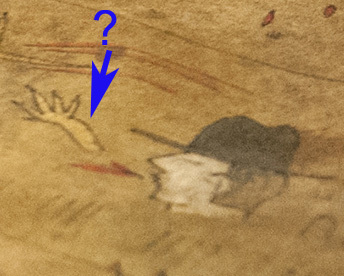 Could it be related to the white dog leg found in Mr.C's trunk after his car wreck and arrest? Indeed. And the frog-moth feet/hands remind of Dr Jacoby's flashed augmented middle finger in part 5.